Anthropologists speculate about how moms in primitive times tucked babies against their chests, their infants’ bottoms covered in leaves that acted as rudimentary diapers. On their backs, more leaves were tucked into animal skin bags. The first diaper bags? Some think so. Eventually, those skins turned into “diapers”, replacing leaves, but the bags carrying extra skins remained a constant. Time passed. Diaper bags that could only be described as boring and utilitarian made their way to store shelves. Eventually, companies marketing baby goods realized that this accessory could use some style. Creative fashion designers began to introduce expensive diaper bags to the market that were immediately snapped up by moms. Thanks to the wildly expanding market for this type of diaper bags, no mom need leave home looking less than fashion forward, which is why our expedition into the world of diaper bag design was no easy process. In fact, there are so many cool, expensive diaper bags on today’s market, choosing six to evaluate was no easy task. But, on behalf of moms who want baby accessories to look as do trendy as theirs, we believe that we succeeded. Whether you’ve got one baby or three, we believe that the following 6 contemporary expensive diaper bags featured in our review are trendy and fashion forward. If you can’t find something you love in this elegant collection, perhaps you can find what you need on this non-expensive list here! 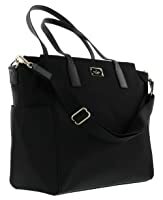 It’s important to start this review by letting you know that the Coach F35414 diaper bag is a great example of this brand’s style and classic look. 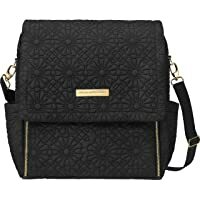 As a result of its popularity, it could be hard to find because despite an impressive price tag, this diaper bag sells out fast. Choose from three colors: brown, khaki pink and khaki saddle, each featuring the Coach logo in the patterning that sprawls across the surface of this “coated” PVC tote. Busy moms access 2 open, exterior side pockets to stow items that could spill or leak and because the outer skin is made of PVC, even toddler spinach graffiti cleans off fast. This popular Coach diaper tote comes with matching baby changing pad and an adjustable, removable strap that can turn this bag into a cross-body carrier, leaving you free to juggle baby, groceries and the bag comfortably, so you never look like a Sherpa! 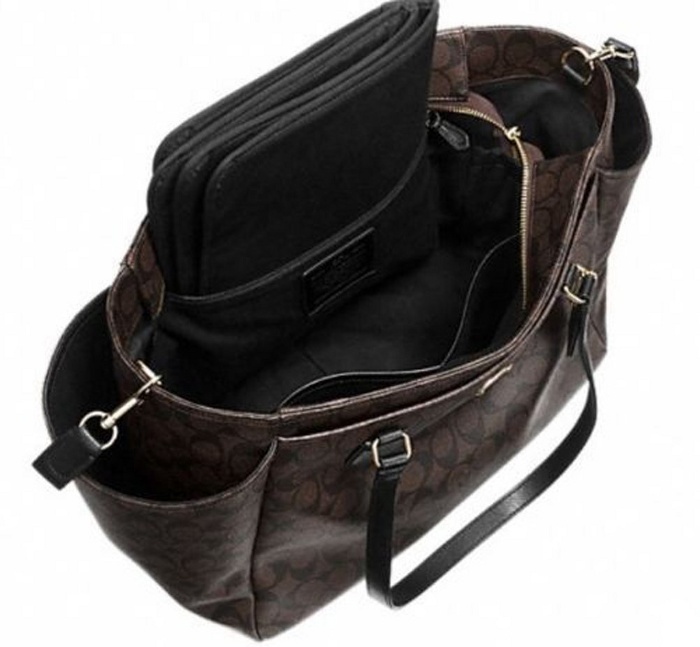 This Coach tote has 2 large zip and 2 large slip pockets plus 2 bottle holder pockets. Official Coach brand tags hang from the bag to tell the world it’s authentic. You can wrap the strap around stroller posts so it hitchhikes on walks. So roomy! This bag measures 17-inches (L) x 11-inches (H) x 7-inches wide. Not everyone loves PVC, even if it is coated, so if you’re a leather-only mom, it’s not for you. This Coach is a pricey choice, so put it on your baby registry only if friends and family are flush. Be prepared for price diversity and back-ordered product on affordable sites. There are no interior dividers; just one big pocket. If you love the brand but can’t resist shopping for design options, this Kate Spade Diaper Bag has your name written all over it. Get the same style and panache by choosing the black edition; save a bundle over the black/pink/white style–or split the difference on the black and white polka dot version. Color selection done, this Kate Spade designer diaper bag in any pattern is prepared to carry loads of stuff. It measures 19-inches (L) x 12-inches (H) x 7-inches (W), so if you seek a jumbo carrier, this one surpasses the aforementioned Coach bag. 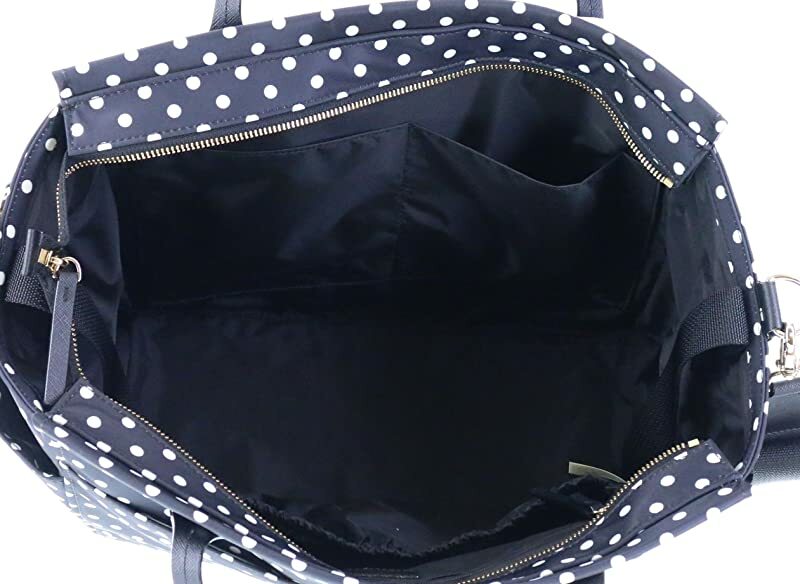 Moms like the thick, adjustable strap that morphs the bag into a cross-body carrier, and the complementary changing pad is embossed with the Kate Spade logo pattern. But here’s where Kate and Coach part ways other than price disparities: This bag comes with gold-clasped stroller connector that attaches to baby’s transport. There aren’t as many pockets on this bag: You get one large outside zip pocket and 2 interior slip pockets. 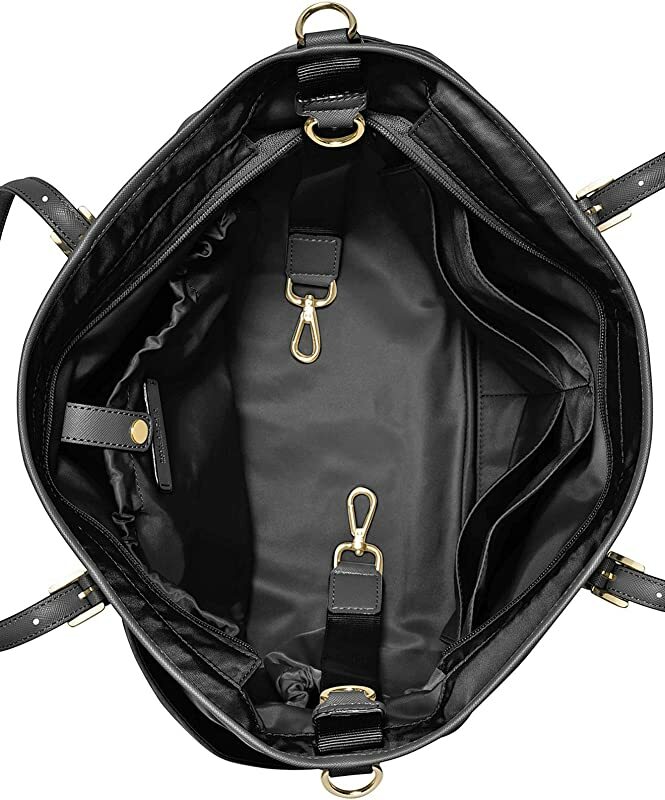 This stylish, authentic-leather diaper bag is trimmed with gold-plated hardware for a luxurious finishing touch, no matter which style you choose. Must we go into detail to extol the virtues of fine leather likely to last through several babies? That gold stroller clasp secures the bag to your buggy in ways a carry strap can’t. If you crave the brand but not the price, you’ll appreciate having options. This bag is extra-large. Got twins? You’re in business. If you’re a vegan committed to sustainable materials, leather may be a turn-off. These diaper bags sell fast, so the style you like may not be available. Bags have been returned due to broken and frayed carry straps. The gold-plated hardware could lose its luster sooner than you prefer. If your purchase is based on number of pockets, this one may not be your first pick. Michael Kors is a genius when it comes to elegant, tasteful haut-couture and ready-to-wear, but who knew he could also pull off a cool diaper bag? This stylish carrier checks off all the boxes, from lightweight nylon construction with handy bottle pockets to the chic changing mat that coordinates with the bag. 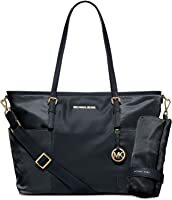 Carry this Michael Kors design with pride knowing that it cleans up quickly and the sturdy double nylon handles and adjustable strap will support any number of items required to keep baby clean and tidy while he’s on the go. Snap tab closures corral loose stuff and gold-tone hardware upgrades the exterior featuring Kors’ classic logo medallion. Like the Goldilocks story, this diaper bag is neither too big nor to small at 16-inches (L) x 6.5-inches (W) by 11.5-inches (H). It weighs 3 pounds, so you can fill it to the brim and not feel like a beast of burden. There are 2 exterior open pockets and a clip-on stroller mechanism–but it’s the 7 open pockets lining the interior compartment that appeals to practical moms most of all. It can easily be used as a cross-body bag given the 9.5-inch strap drop. Though the bag is crafted of lightweight nylon, handles and trim are made of authentic Saffiano leather. 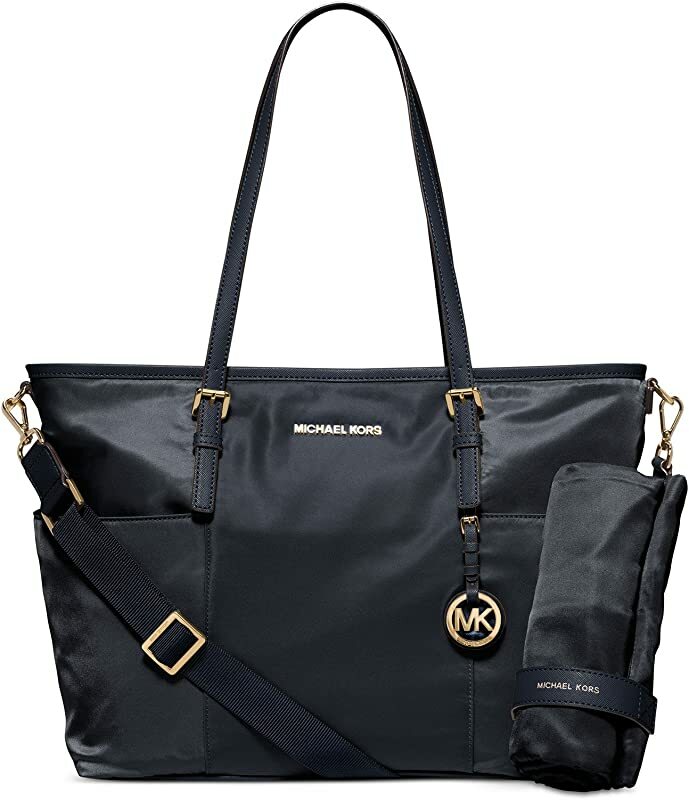 It’s designed by Michael Kors who always gets it right. Looks more like a woman’s purse than a diaper bag, which may be exactly what you seek. If you object to products that are fabricated overseas, Vietnam origins could be a turn-off. Returns are due to handles falling apart on some bags. Not every new mom craves a diaper bag that’s only available in navy and black. Due to the flimsy material, you may be paying for the name over the bag’s quality. Having a baby is serious business, but that doesn’t mean you your diaper bag must be taken seriously; reason enough for fans of the Petunia Pickle library of baby products to be predisposed to anything featuring this quirky corporate name. More affordable than high-profile competitor bags, this design is eminently practical and comes in 15 colors and patterns, one of which is guaranteed to delight you. Fill this boxy backpack diaper bag with essentials because it only weighs 2.9 pounds. Even if you fill it with everything under the sun, the weight is evenly distributed across your back, so you don’t have to put the number of a chiropractor on speed dial. Measuring 16-inches (L) x 15-inches (H) x 6-inches (W), the embossed covering gives this bag a sophisticated look, but since the textile is glazed canvas polyester, it’s soil-resistant, too. That extends to the interior water-resistant lining. Hang it from your stroller if you don’t want to lug it around, knowing that sturdy zippers will keep contents contained, no matter how many outdoor adventures you and baby undertake. It’s unique, affordable and fun. Huge sales numbers are only surpassed by the brand’s fan base! Zipper access and magnetic closure feature make accessing contents while juggling baby a breeze. The built-in changing pad is impossible to lose because it’s attached. 6 interior side pockets hold all sorts of stuff–including your keys and smartphone. While all of the straps are efficient, they’re not padded. There have been reports of zippers malfunctioning, straps breaking and seam stitching coming apart. The metal tag feature is susceptible to scratching and marring. Lacks the panache of a true designer bag. Three textile patterns available on this Itzy Ritzy diaper bag give you an opportunity to flaunt your style. Choose from Black Herringbone, Posy Pop (a riot of flowers) and Coffee and Cream. Itzy Ritzy bags are crafted of “vegan leather,” a pseudonym for a mix of 87% Polyester, 5% Polyurethane and 8% wool. At just 2.5 pounds, the dimensions of this bag are 18-inches (H) x 10.5-inches (W) by 7-inches (D). 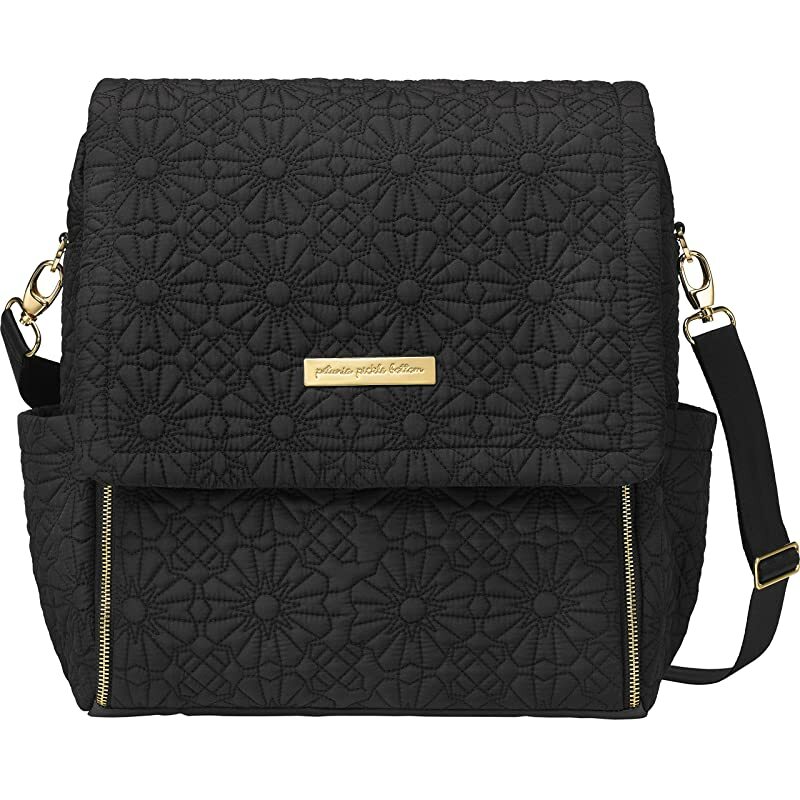 Moms could feel they’ve hit the lottery upon discovering the number of pockets Itzy Ritzy designers added to this diaper bag. There are 17! Twelve of them are fastened to the bag’s interior and five external pockets hold items moms need most (e.g., 2 insulated bottle pockets and a compartment that’s great for keys). Wear this as a backpack or use the handle to carry this diaper bag in the traditional manner, but when you put it down, patent-pending rubber feet that emulate moccasin shoe soles keep the bag from collecting surface soil. The easy-wipe changing pad gives mom a laugh while changing diapers: one end is marked “Head;” the other says, “Toes.” Use the two coordinating straps to tether the bag to the stroller and you’re good to go. It’s fresh, fashionable, affordable and designed to show off your personality. Little touches–like those sturdy moccasin sole feet–mean a lot to fastidious moms. 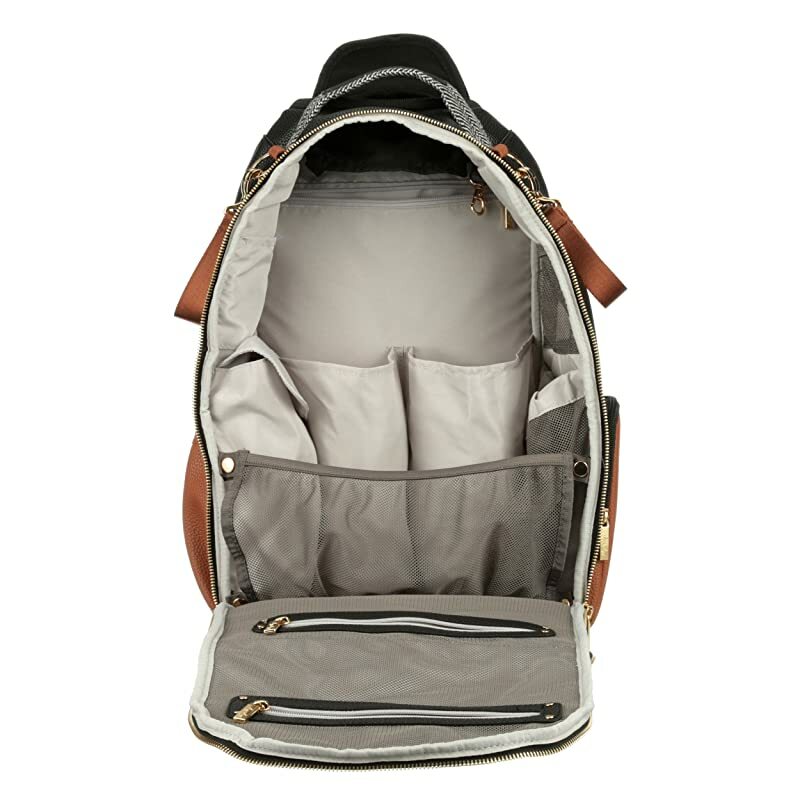 A dual-purpose diaper bag (carry or backpack) with 17 pockets? Yes, please! Dads love the black version when it’s time to take baby out solo. If you need a diaper bag that can be tossed into your washing machine, this isn’t it. Continually stuff this bag with hefty contents and the stroller straps may give out. Prefer to avoid buying products made of synthetics? Keep shopping. Returns are due to quality control issues like badly attached pockets, split seams, and broken zippers. 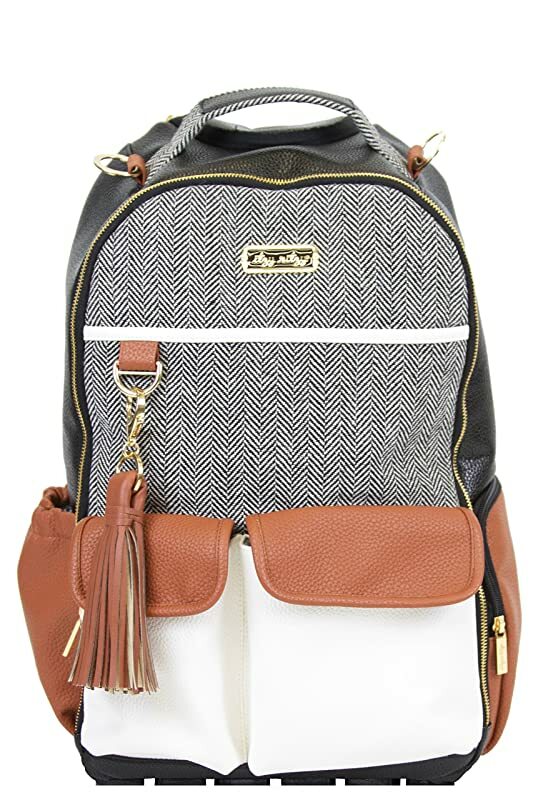 This Isoki bag has all of the bells and whistles pricier bags include, but at a kinder and gentler price. Both functional and fashionable, this bag comes with an adjustable shoulder strap and cute, removable stroller clips. 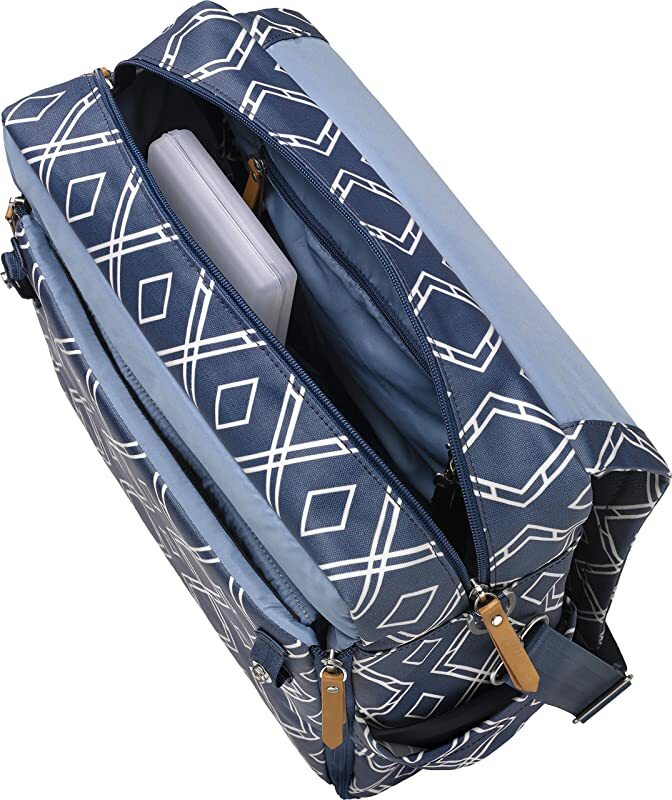 Fashion-forward moms love the fact that this diaper bag morphs into a stylish carrier once baby no longer needs a vessel for necessities, so you can use it for a weekend getaway or gym bag. Available in either black or tan, this plastic bag is easy to clean, features two long access zippers and weighs 3.2-pounds. At 16.7-inches (L) x 7.1-inches (W) x 12.6-inches (H), it’s roomy enough to tote everything you need for babies’ comfort and yours, too. 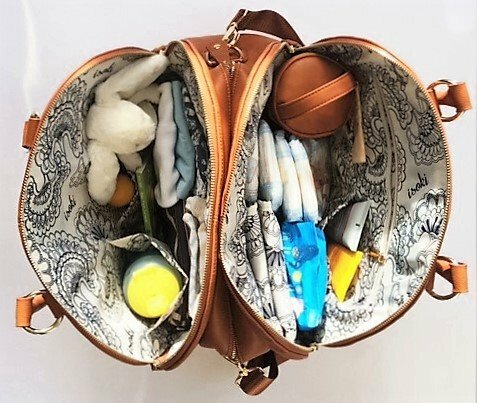 Fully opened, this bag resembles a butterfly, revealing three fully-lined compartments, so you can stash moist bottles on one side and dry diapers on the other. Made in Australia, this no-frills diaper bag seems to have found an equally important use as a school bag, business tote, and travel bag, because it doesn’t scream “diaper bag.” Count on this tote to stay neat and clean under extreme circumstances because there’s nothing like plastic when it comes to clean up. Beloved by practical women who don’t care about designer names, this Aussie bag is the bomb. Spill anything you like within the interior and clean it up in a flash. If you crave a carrier that looks like anything but a diaper bag, this could be it. 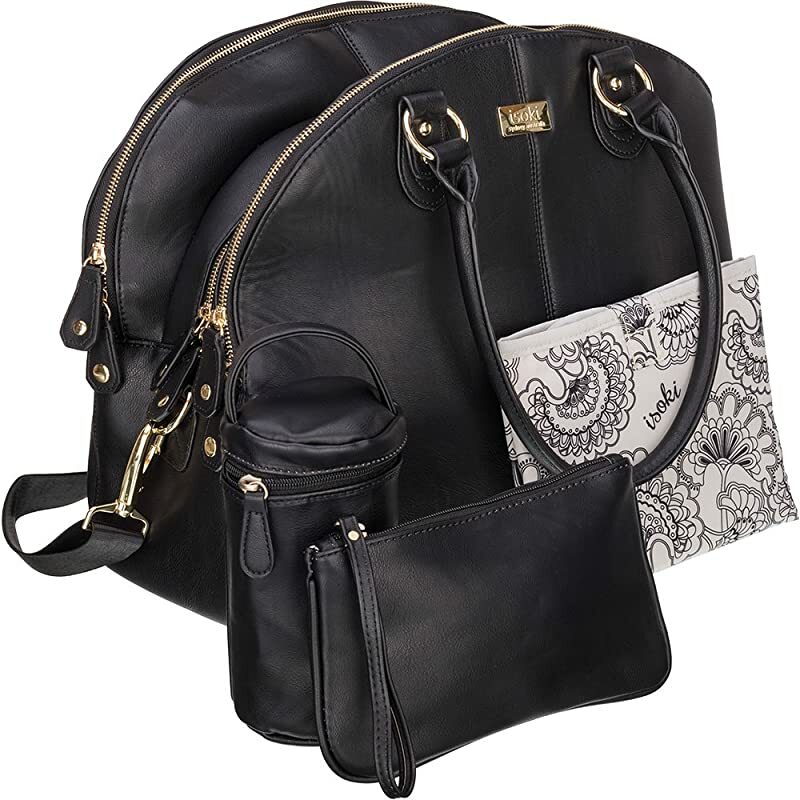 Get an elegant-looking diaper bag without liquidating baby’s college fund. Straps may tear or come loose after a short period of use. Stroller strap clasps could break, leaving you no way to fasten the bag to the frame. The interior lining can trap unpleasant odors if the bag isn’t cleaned and aired properly. Photo & Video credits: Amazon, Header Photo by Ali Morshedlou, Casey Ferguson, Liza Adele, Justine Marie, The Sensible Mama, Bronwyn at Four to Adore Australia.